When you ask people about Prohibition in the United States, the response they most readily provide is that for some strange reason it became illegal to drink alcohol of any kind. This is usually accompanied by mystified looks and slow shakes of the head. Unfortunately, what many don’t know is why this occurred and that it was actually part of our Constitution at one time. So, here’s a little history lesson born of my own need to understand Prohibition more thoroughly for the sake of my novel, The Secrets of Dr. John Welles. By definition, Prohibition was the legal prevention of the manufacture, sale, and transportation of alcoholic beverages in the United States from 1920 to 1933 under the terms of the Eighteenth Amendment. Note that the consumption and private possession of alcohol was not illegal, so what a person already owned could be enjoyed in his or her own home. Just drink responsibly and sparingly as it was now tougher to resupply one’s stash. The National Prohibition Act, known informally as the Volstead Act, set down methods for enforcing the Eighteenth Amendment, and defined which intoxicating liquors were prohibited, and which were excluded from Prohibition (e.g., for medical and religious purposes). The Amendment was the first to set a time delay before it would take effect following ratification, and the first to set a time limit for its ratification by the states. Its ratification was certified on January 16, 1919, with the amendment taking effect on January 16, 1920. For the following 13 years Prohibition was officially in effect, though the ability to enforce it was limited by the Volstead Act and by corrupt and complacent politicians who overlooked illicit manufacturing and smuggling. The Anti-Saloon League’s Wayne Wheeler conceived and drafted the bill, which was named for Andrew Volstead, Chairman of the House Judiciary Committee, who managed the legislation. The Anti-Saloon League was the leading organization lobbying for Prohibition in the United States in the early 20th century. So, why all this hatred toward alcohol? The Eighteenth Amendment was the result of decades of effort by the Temperance Movement in the United States and at the time was generally considered a progressive amendment. The Temperance Movement, which went back as far as the late eighteenth century, was born of the concern for alcoholism and how it played into spousal abuse, family neglect, and chronic unemployment. However, the desire for cheap, plentiful alcohol led to relaxed ordinances on alcohol sales, and the problem persisted. A tract published in 1784 by Benjamin Rush detailing how excessive use of alcohol was harmful to one’s physical and psychological health. Many people got on board with the idea, initially proposing temperance rather than abstinence, but like most well-meaning organizations, political in-fighting stalled the group. Throughout the decades, the Temperance Movement received support from various religious denominations and temperance groups, but it also took a back seat to issues such as slavery during the Civil War. It wasn’t until the third wave of temperance that any movement achieved success. With the formation of The Anti-Saloon League by Rev. Howard Hyde Russell in 1893, the Temperance Movement found footing not by demanding that politicians change their drinking habits, only their votes in the legislature. Under the leadership of Wayne Wheeler, the Anti-Saloon League stressed political results and perfected the art of pressure politics. The Anti-Saloon League’s motto was “the Church in action against the saloon,” and it mobilized its religious coalition to pass state and local legislation, establishing dry states and dry counties. By the late nineteenth century, most Protestant denominations and the American wing of the Catholic Church supported the movement to legally restrict the sale and consumption of alcoholic beverages. These groups believed that alcohol consumption led to corruption, prostitution, spousal abuse, and other criminal activities. Brewers and distillers resisted the reform movement, which threatened to ruin their livelihood, and also feared women having the vote, because they expected women to vote for Prohibition. The Anti-Saloon League achieved its main goal of passage of the Eighteenth Amendment on December 18, 1917. Just after the Eighteenth Amendment’s adoption, there was a significant reduction in alcohol consumption among the general public and particularly among low-income groups. Consumption soon climbed as underworld entrepreneurs began producing rotgut alcohol, and the speakeasy quickly replaced the saloon. Likewise, there was a general reduction in overall crime, mainly in the types of crimes associated with the effects of alcohol consumption, though there were significant increases in crimes involved in the production and distribution of illegal alcohol. Those who continued to use alcohol tended to turn to organized criminal syndicates, who were able to take advantage of uneven enforcement, suddenly overwhelmed police forces, and corruptible public officials to establish powerful, murderous smuggling networks. 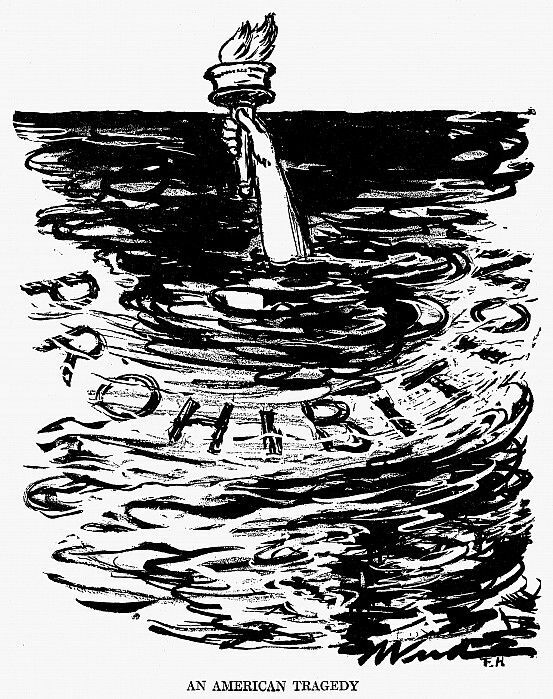 Anti-prohibition groups arose and worked to have the Amendment repealed once it became apparent that Prohibition was an unprecedented catastrophe. The Amendment was repealed in 1933 by ratification of the Twenty-first Amendment, the only instance in United States history that a constitutional amendment was repealed in its entirety. Well, I must say that was informative while slightly boring. I guess it’s good to know what happened way back then, so….I’ll drink to that.